Telegrama was originally created from an idea for the relationship between Pixe and Smoo. In 1992 when I designed them, both Telegrama Raw and Telegrama Render had other names.These almost completed fonts were put aside and forgotton until I re-discovered them in 2008. This time, I united the two fonts as a family and decided to present them with small adjustments and some additional accented European characters, etc. 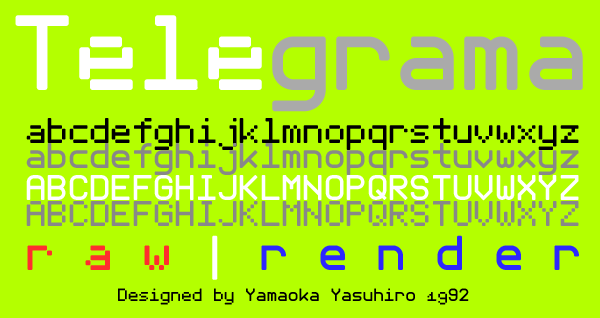 Telegrama is designed by Yamaoka Yasuhiro 1992. ©1992-2011 YOFonts/Yamaoka Yasuhiro.